Two Tone Diamond Engagement Ring designed by Gabriel & Co., available at Emma Parker & Co. If you're interested in a unique engagement ring design, a twisted band can offer a subtle, beautiful alternative to the standard setting. From mixed metals to platinum, gold, and silver, these rings come in a wide range of styles and sell at various price points. One of these options may be perfect for you if you're looking for a twist on the traditional. Two-Tone Split Shank Engagement Ring - This 14k white gold and yellow gold offering from Emma Parker & Co. features interlaced twisted yellow gold and pave-set white gold elements. It comes unset and retails for around $1,600. 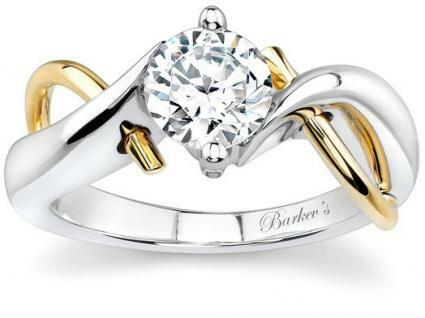 Two-Tone Solitaire - This pretty 14k engagement ring from Barkev's comes in two multi-tone styles: white gold twisted with yellow gold or white gold twisted with rose gold. 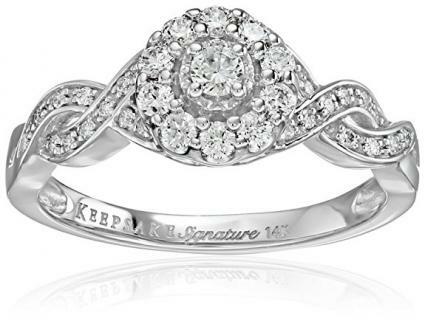 The design is modern, featuring an open, twisted shape surrounding the one-carat round-cut center diamond. Pricing varies based on setting customization and center stone selection. Pink Gold Twisted Band Ring - This gorgeous offering from MDC Diamonds is crafted in 18k pink gold and features 0.75 carats of pave-set diamonds accenting the twisted band. The ring is designed for an emerald-cut center stone, which is not included in the price of just over $2,000. Diamond Halo Engagement Ring Twist Setting - This 18k white gold offering from Bel Dia is available from Amazon. The band and halo features 1 carat total weight of white diamonds and can accommodate a center stone ranging from 1/2 carat to 2 carats. Pricing ranges from $3,250 - $4,330 depending in center stone selected. White Gold Diamond Halo Twist Engagement Ring - Crafted of 14k white gold, the front of this band from Amazon features a delicate twisted shape. The ring has a round-cut center diamond encircled by smaller diamonds. The ring retails for just under $1,000. Simply Bridal Twist Solitaire - This classic ring from Hearts on Fire is 18k white gold and features a 0.20-carat round diamond set atop the gently twisted shank. It retails for about $1,800 and can be customized with a larger center stone and your choice of precious metal. 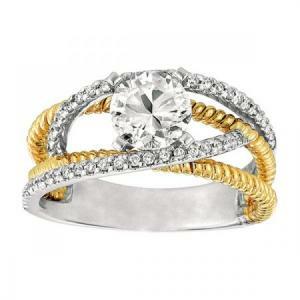 Twisted Rope Solitaire - This pretty ring from Brilliance is another take on the simple twisted design. Instead of a twisted split shank, the simple 14k white gold band is a twisted rope. The setting, which doesn't include the center stone, retails for $450. Whether you choose a simple twisted band or an elaborate two-tone design with diamonds, this style of engagement ring is an instant classic. The graceful lines and delicate profile will look just as stylish years from now as they do today.